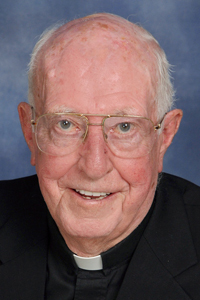 Father Francis X. Herron, 87, a former pastor of St. Joan of Arc Parish, Philadelphia and St. Irenaeus Parish, Philadelphia, died Jan. 6. He was the last surviving of three priests in his family. His older brother, Msgr. Bernard Herron, was also a priest for Philadelphia and his younger brother, Msgr. Joseph Herron, was a priest for the Camden Diocese. He was born March 29, 1930, the son of the late Daniel J. Herron and the late Beatrice (Allen) Herron. He attended Transfiguration School and West Catholic High School for Boys before entering St. Charles Borromeo Seminary. Father Herron was ordained May 19, 1955 at the Cathedral of SS. Peter and Paul by Archbishop John F. O’Hara and his first assignment was as parochial vicar at St. Stephen Parish, Port Carbon. He also served at St. Peter, Reading; St. Joseph, Ambler; St. Patrick, Malvern; St. John Bosco, Hatboro; St. John the Baptist, Philadelphia; St. Anne, Philadelphia and St. Edmond, Philadelphia. He then served as pastor of St. Joan of Arc, Philadelphia, from 1987 to 1993, and of St. Irenaeus, Philadelphia, 1993-1994. He was assigned as parochial vicar at Visitation B.V.M., Norristown, and Our Lady of Good Counsel, Southampton, until his retirement in 2002 with residence mostly in Longport, N.J.
Father Zachary Navit, who was assigned with Father Herron at Visitation B.V.M., remembers him as a mentor. “I could go to him for good, sound, practical advice that came from his deep faith,” he said. On a personal level, Father Navit recalls Father Herron as a member of “Arnie’s Army” who enjoyed golf, but also the Jersey Shore where his family had a home, plus visits to his ancestral home, Ireland. Although Father Herron had the Irish wit that goes with his heritage, “he was basically a quiet man, but what he said was important,” Father Navit recalls. There will be a viewing for Father Herron at St. Francis of Assisi Church, Springfield, on Wednesday, Jan. 17 at 9 a.m., followed by his 11 a.m. funeral Mass with Archbishop Charles J. Chaput as the celebrant. Concelebrants will include Fathers Francis Mulranen, Wilfred Maloney, Edmond Speitel, Richard Hadyka and Father Navit, who will be the homilist. Father Herron is survived by his sister-in-law Mary Herron, his nephews and a niece, and grandnephews and grandnieces. Interment will be at Holy Cross Cemetery, Yeadon. Fr. Herron married me and my husband back in May of 1967 while he served at our parish, St. Matthew in Mayfair. I often thought of him over the years and three years ago I wrote to the Archdiocese to find out if he was still living. They, in turn, let Father know I was searching for him. Several weeks later I got a telephone call from him and we had a long conversation. That was in January of 2015. I am very sorry to hear of his death and offer my condolences to surviving family members.